Feb. 26, 2018 - This year’s challenge consisted of mid-size, full-size and HD entries – 10 trucks total – all vying for a win in what is now the 11th year of the Canadian Truck King Challenge. We tested 10 2018 pickup trucks covering the 2500 HD segment; two midsize and five full-size pickups completed the rest of the 2018 entries. 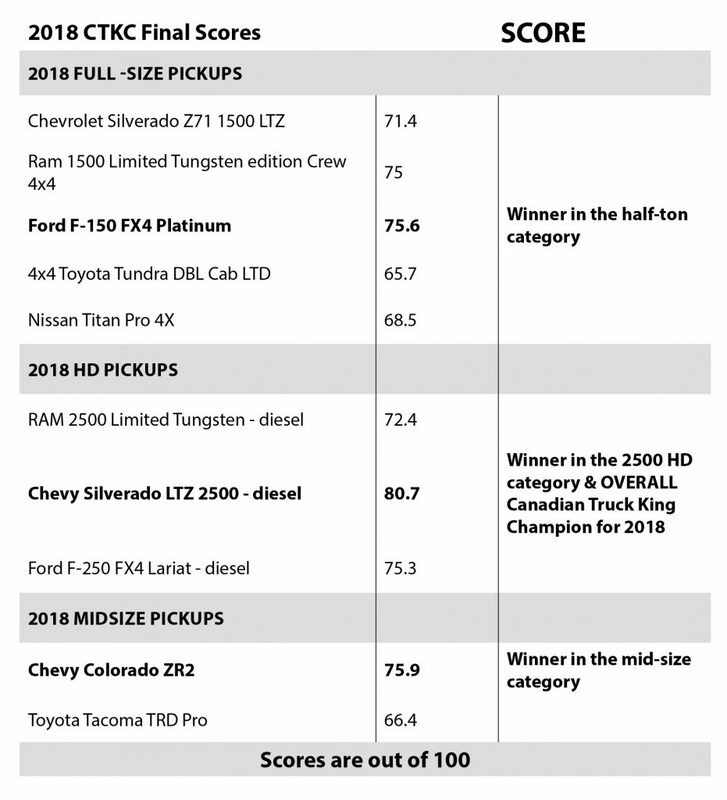 A complete list of scores by model reveal our choice for the winner of the 2018 Canadian Truck King Challenge. As most readers know the Canadian Truck King Challenge does what we call real-world testing. Our journalist judges drive the trucks on a prescribed course empty, then with payload and finally towing a trailer on this same route – one after the other, back to back. This year judges drove more than 3,000 kilometres during testing while scoring each truck across 20 different categories. These totals are then averaged across the field of judges and converted to a percentage out of 100. The HD trucks and the midsize category used our usual Head River, Ont., test loop, while half-tons were tested on a new loop in Halton Hills, Ont., using the same method. Midsize trucks carried a payload of 500 lb and towed 4,000 lb. The half-tons hauled payload of 600 lb and towed 7,000 lb; while the ¾-tons towed 10,000 lb and used 1,000 lb for payload. The weights we use never exceed those published manufacturer limits. Each year we use electronic data recorders during testing to capture real-world fuel economy. An outside company, FleetCarma, collects, and translates the data from each truck giving us a unique fuel economy report that shows not only empty consumption, but also consumption while loaded and while towing. 2018 Chevrolet Colorado ZR2 – 2.8L Duramax diesel, 6-speed automatic, 4WD, Crew Cab – 4-door, off-road tires; skidplates; suspension lift; DSSV shocks, base MSRP: $42,215, price as tested: $45,485. 2018 Toyota Tacoma TRD Pro – 3.5L V6 Atkinson cycle engine, 6-speed automatic, 4WD, Double Cab – 4-door, all-terrain tires; aluminum skidplates; Fox racing shocks, base MSRP: $53,295, price as tested: $53,295. 2018 Ford F-150 FX4 Platinum – 5.0L V8, 10-speed SelectShift automatic, 4WD, Crew Cab – 4-door, Auto stop/start standard; adaptive cruise w/precollision, base MSRP: $70,579, price as tested: $78,699. 2018 Chevrolet Silverado Z71 1500 LTZ – 5.3L V8 Ecotec3 w/cylinder deactivation, 8-speed automatic, 4WD, Rancho shocks; underbody shield; hill descent; Wi-Fi, base MSRP: $56,725, price as tested: $65,075. 2018 Ram 1500 Limited Tungsten edition Crew 4×4 – 5.7L Hemi V8 w/MDS , 8-speed TorqueFlite automatic, 4WD, Crew Cab – 4-door, 4-corner air suspension; RamBox, base MSRP: $63,890, price as tested: $74,550. 2018 Nissan Titan Pro 4X – 5.6L V8, 7-speed automatic, 4WD, Crew Cab – 4-door, Pro 4X off-road package, base MSRP: $63,050, price as tested: $63,050. 2017 Ford F250 FX4 Lariat (*there are no changes for 2018) – Power Stroke 6.7L V8 turbo-diesel, TorqShift, 6-speed, SelectShift automatic, 4WD, Crew Cab – 4-door, FX4 adds off-road tires and underbody protection, base MSRP: $62,249, price as tested: $92,364. 2018 Chevrolet Silverado 2500 LTZ Z71 – Duramax 6.6L V8 turbo-diesel, Allison 6-speed automatic, 4WD, Crew Cab 4-door, Z71 adds off-road tires, skid plates & Ranchero shocks, base MSRP: $ 62,865, price as tested: $ 79,805. 2018 Ram 2500 Limited Tungsten Edition – Cummins 6.7L I6 turbo-diesel, 6-speed automatic, 4WD, Crew Cab – 4-door, auto-leveling rear air suspension, base MSRP: $69,995, price as tested: $92,105. The winner of this year’s challenge is a truck that has been refined year after year adding technology and improving its diesel engine. It’s now, in the opinion of the judges, the best 2500-series HD hauler on the market. This 2018 version of the Silverado HD came to us equipped with a new generation of the 6.6L V8 turbo-diesel. It’s been redesigned with a new cylinder block and heads. Its oil and coolant flow capacity has been increased and the turbocharging system is now electronically controlled. Horsepower has increased to 445 and torque now reaches 910 lb-ft. Ninety per cent of both numbers is achieved at just 1,550 rpm. 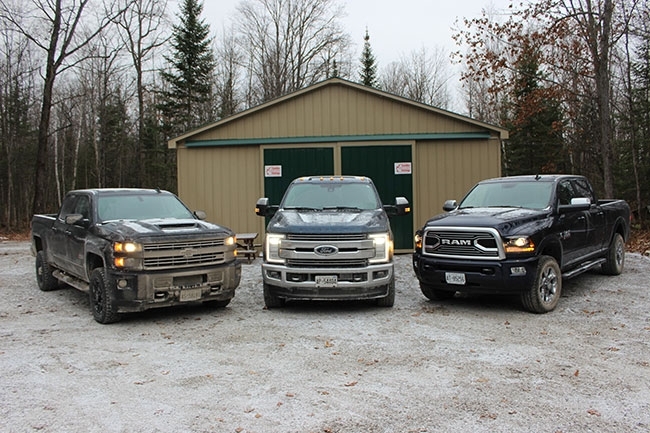 Of particular interest to Canadians will be the new Duramax cold-weather performance. With microprocessor-controlled glow plugs the engine requires less than three seconds to preheat in temperatures as low as minus -29 C. These new ceramic glow plugs adjust current to each plug based on outside temperature. This new engine continues to be coupled to the Alison 1000 six-speed automatic transmission which has a stellar reputation. But past the mechanical updates, this Chevrolet impresses with the number of electronic driver assist features that make moving loads easier and safer over all. Visual help is found in the Chevrolet MyLink with an eight-inch-diagonal touchscreen. Thank you and congratulations to all the participants and winners in the 2018 Canadian Truck King Challenge. For more detailed information on all of this year’s entries please visit www.truckking.ca.